As a blogger and general designer person, I often have the need for some cool pics. I could in theory take photos of stuff, but I don't have the time or the expertise to come up with something good. My companion throughout my blogging days has been sxc.hu. I was quite surprised about the domain, since it's Hungarian (wohoo! ), but the quality is absolutely spot on. Searching for any term will yield pages of relevant stuff. The top line of photos is from their stock photos site for cash, but all the others are free and of the same quality. The most you will have to do is post an acknowledgment on the page or notify the author, which is the least I can do for a otherwise free to use image. You can also use Flickr and DeviantArt, but in this case you will have to ask for permission in advance and I'm an impatient guy, so I only do this if I really love an image. It isn't nice, but in theory you can use any image you find on the web. Where do you get your free images, I'd love to get some more sources! 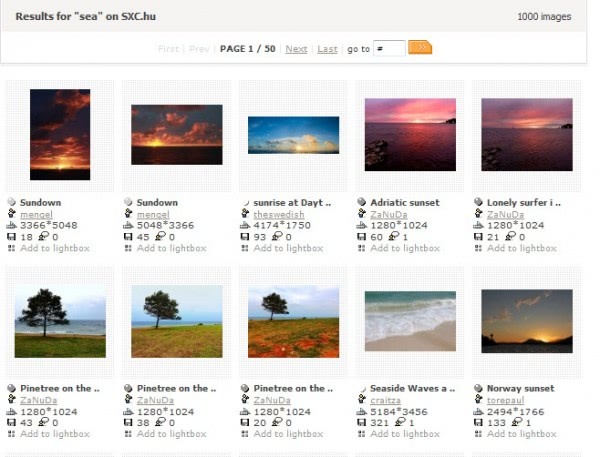 You can use Flickr's search to only find images that are licensed under creative commons. This usually means that you can use the images from the site as long as you attribute the work to the original author. Just head over to the advanced page on Flickr, enter the search term you are interested in and make sure to check the "only search within Creative Commons-licensed content". Make sure you check "find content to use commercially" if you want to use the images on a commercial website, or "find content to modify, adapt, or build upon" if you want to modify the images on your own. Hi – compfight.com is also incredibly useful – searches Flickr and you can specify Creative Commons licensed images so you know you’re likely to find /something/ you can use. Just had a revamp as well. Since Compfigt didn’t work with Opera, I use the search function in Creative Commons. morquefile is a pretty nice project. “A place to keep post production materials for use of reference, an inactive job file. This morgue file contains free high resolution digital stock photography for either corporate or public use. Interesting one, I am mostly using Flickr searching for CC-licensed stuff. Will try this on next time I do post with images.